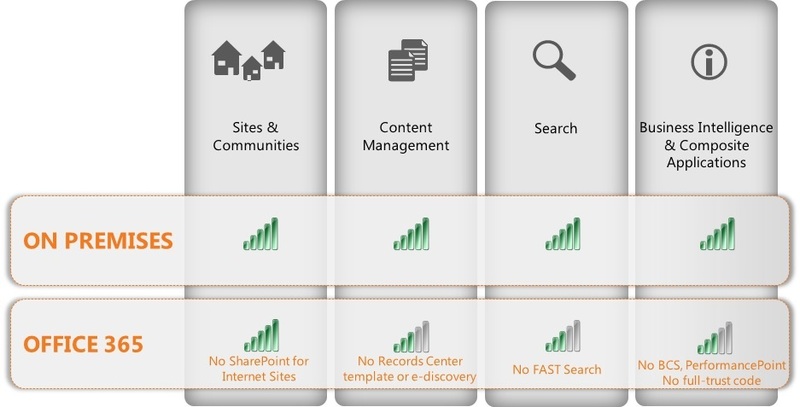 February 2014 – Share SharePoint Points ! Before starting let me clear that, when part or all of your data center exists physically on your campus(es), then you have an on-premises (not “on premise”) solution. Maintaining a SharePoint farm on-premises is startlingly complex and expensive. SharePoint is a Windows Server-based, multi-tier ASP.NET Web application that uses SQL Server for its data tier and relies heavily upon Web standards and the .NET Framework. When you add in other, related Microsoft servers such as Exchange and Lync, then between physical hardware, electricity, licensing, and support costs, you are facing a huge investment of time, money, and effort. Microsoft gives us SharePoint Online and Office 365 as a cloud-based alternative to deploying and maintaining an on-premises farm. Specifically, the Office 365 product is a particular type of cloud computing known as software as a service, or SaaS. SharePoint online is one of product included in MS online service solutions and is part of Office 365. Microsoft had released SharePoint 2013 and its online counterpart via the latest rev of Office 365, Now decision makers are forced to think whether to deploy it in-house or use the latest cloud-based iterations of the collaboration platform. 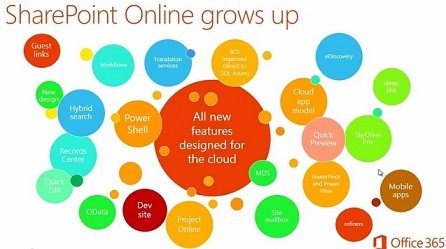 SP Online can also be put as standalone product or part of one of the plans offers by Office 365. End user or employee can easily access office documents and data online without operational overhead or infrastructure investment. It provide everyone on the team with access to critical business information when and where members need it. Share information with employees, partners and customers in a way so that priorities, security and reliability always maintained as it was there on other version of SP. Now you can able to access the office 365 SharePoint Online. User now can access SharePoint Online site on an internet-connected mobile phone or tablet. By accessing the site on a mobile device, it provides the flexibility to access information on sites, collaborate with colleagues, access shared documents, view updated site content, and otherwise stay connected with your work. To access a site using the optimized mobile browser experience, a new feature named Mobile Browser Viewer must be activated on the site. If activated, this feature checks the device’s mobile browser to determine if it can handle HTML5. If the mobile browser supports HTML 5 the contemporary view is shown. Otherwise, the classic view is shown. Below is the quick high level comparison between SP on-premise and SP Online. In terms of the Sites and Communities SP online is pretty close to Server except the internet sites support is not available. The content management does not have record center and e-discovery features in SP online. In terms search FAST is also not included in Online. At the right side of the image there is business intelligence & composite applications, BCS is not supported. Also you don’t write code which runs at farm level. One very significant feature in SharePoint online I want to delineate here is Office web app feature. Office Web Apps are <b>touch-friendly</b> web applications that let you create, edit and share your Excel, Word, PowerPoint and OneNote files from any browser.You can <b>share</b> and <b>simultaneously</b> work on your documents with classmates, friends and co-workers. A very good example of working office app in browser is here. 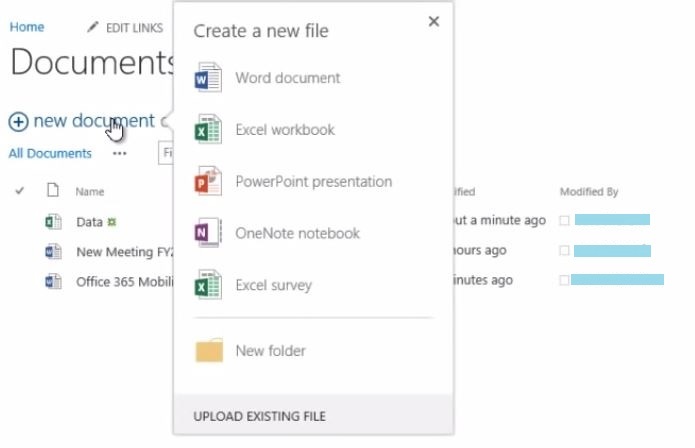 Office app allows users to perform anything they can do without installing actual Office package. No Farm level features are allowed. Microsoft recommendation for customizing sharepoint online is to use App Model. There are several reasons behind this recommendation. Using app model we never deploy code to server which ensures servers security and less changes to deploy unauthorized codes. Apps can word both with Online as well as on-premises versions. So in case clients prefer to use the hybrid architecture it is easy to customize. Using the apps we can deploy List, Worflows, Pages, Client Webparts, Content types and Site columns, Ribbon Custom Actions. NAPA is one of the app development tool provided by Microsoft to make developer’s life easy. I will explain how one can install and use NAPA tool to development. Developing Metadata fields is always a complicated case of the developers. My previous posts(Add Metadata Taxonomy Custom Field using Visual Studio) I explained how we can create metadata site columns. 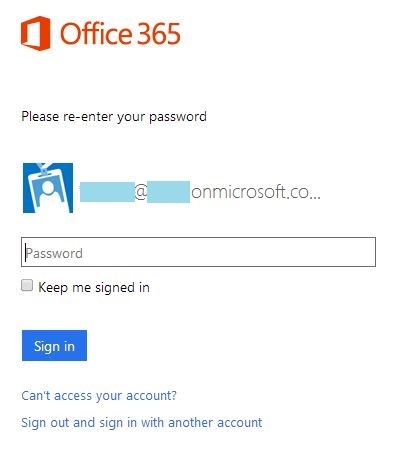 In this post, I will target Office 365/SP online users who can only use sandbox solutions to update/create metadata fields. In practical scenario, Metadata service details like SSPID, Default term store etc keep on changing. I notice that the name of Metadata service of SharePoint Online keeps on updating after some updates. We all know that code in sandboxed solutions is being deprecated by Microsoft. But even if we were happy to use sandboxed code – in Office 365/SharePoint Online, we cannot use the Microsoft.SharePoint.Taxonomy namespace in server-side code anyway – the net result is that we are unable to “finish the job” in this way to ensure the field is correctly bound to the Term Store. This is a problem! Even worse, whilst it is possible in the CSOM API to bind the field, having this execute in the provisioning process (e.g. as a site is being created from the template) is challenging, maybe impossible. Maybe you could come up with some imaginative hack, but that’s probably what it would be. If I talk about the solutions of this issue, then our thoughts might lands on setting the metadata field manually. But again its very tedious for clients to do such configuration for 500/1000 sites. There could be one alternative which can save our life if we can figure out the SSPID and Termset Id for particular environment . Following is the code for creating custom fields if you want to map the columns with particular Term set provided you must be aware of two of the required Ids. Make sure you replace SSPID and TermSet ID with your metadata store IDs. In my previous blog(Add Metadata Taxonomy Custom Field using Visual Studio), I have explained how we can add custom metadata taxonomy custom field. In the feature code we have to write code to bind the field with the taxonomy term set. I just used this code but unfortunately this object returns me null :). Then after spending few hours I found that there is a configuration which allow us to behave term store as default term store. 2) Search for “Manage service applications” which will open the list of all services configured on farm. 3) Click on instance of “Managed Metadata Service”. DONOT click on link just click on the service row just to select this service. Push-down Content Type Publishing updates from the Content Type Gallery to sub-sites and lists using the content type. This service application is the default storage location for Keywords. This service application is the default storage location for column specific term sets. 6) Now “OK” button, the DefaultSiteCollectionTermStore was filled and ready for further use. Custom Taxonomy Field creation is very common requirement while working with the different clients. In this post I will explain how we can create a custom metadata type column. Once metadata field is added as site column, it can easily be added as custom list column or field to any of the content type. Step 1: Create a fresh project of type “SharePoint 2013 Project”. After providing basic properties of project like Farm/Sandbox solution and SharePoint site Url project is ready to add field into the site. Step 2: Now its optional to create new folder “Site Columns” as per the project coding standards. But in case you are adding multiple custom columns then I recommend to add a new folder as I did. Step 3 : Next, Just hit right click on the project/folder and say “Add > New Item” from the menu options. Then select “Site Column” from the item list. Give any relevant name to your column. Step 4: After you hit “Add”, a new module will be added to the project or folder with default Element.xml file. Here you have to make some changes as this default xml will create a custom column of type “Text” which is not our requirement. 1) The Id attribute should have unique Guid values for both of the fields. Till this step you are able to add the metadata column but there are little more things to make this functional. Step 5: You must have noticed a default feature will be added to your project. Now right click on that feature and select “Add Event Receiver” to this feature. Step 6: Next is to bind our newly created field with a taxonomy term set. This will require name of the group and name of the term set under managed metadata service. NOTE: Before implementing this, I would like you to think a bit on targeted version on SharePoint. If you are working with SharePoint Server version and deploying Farm solutions then add event receiver code to bind column with Termset. This is all you need to do to create a custom metadata site column. Save and deploy your solution in SP site. In order to check the newly created columns please navigate to Site Settings > Site Columns. 1) Group Name: Make sure you have added Metadata group with same name mentioned in feature receiver. 2) Term set Name: Make sure you have added Metadata Term set under the same group with same name mentioned in feature receiver. 3) DefaultSiteCollectionTermStore: May be the case that you are not able to pick default term store. Please refer to my next blog(Sharepoint Defaultsitecollectiontermstore is null) to find out solution of this. 4) If you are creating list by referring this custom column then you might get this error- “The SPListItem being updated was not retrieved with all taxonomy fields.” Please refer to my this blog to see the resolution.